This has been a pretty annoying issue, first when Compiling the App, and then Archiving it for App Store submission. This is how i solved all the issues related to GooglePlus SDK for iOS. As it’s explained in this StackOverflow question. I had to go to Build Settings, and inside “Architectures”, select YES in “Build for Active Architectures” (“release” was NO by default), and inside “Base SDK”, put “Latest iOS (iOS 7.1)”. 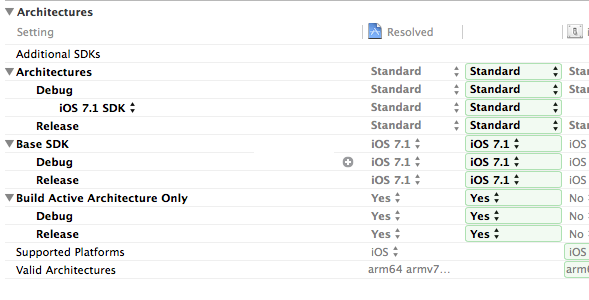 Apart from that, also had to select a development team in the “Basic” section, and “7.1” as the deployment target. After all these changes, I could archive the App and submit to the App Store. This entry was posted in Uncategorized and tagged arm64, error, GooglePlusSDK, iOS, linker. Bookmark the permalink.